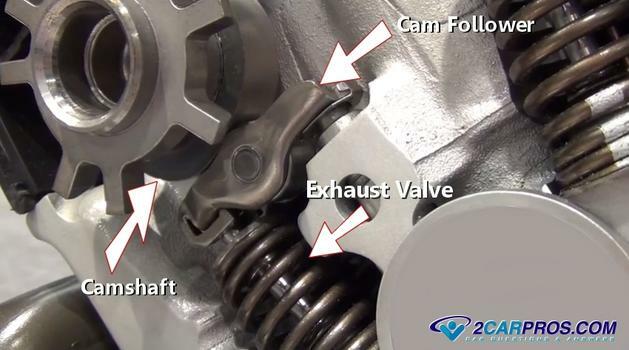 Learn how your car's engine camshaft works. We are a team of ASE certified mechanics that have created this service guide to help you understand in block and overhead camshaft configurations. A camshaft is a cylindrical rod that is situated in the cylinder block or head which has oblong lobes or cams which push intake and exhaust valves open. All internal combustion engines have at least one camshaft even hybrid cars. There are two popular styles of camshaft systems which are called overhead cam (OHC) and in block camshaft configurations. 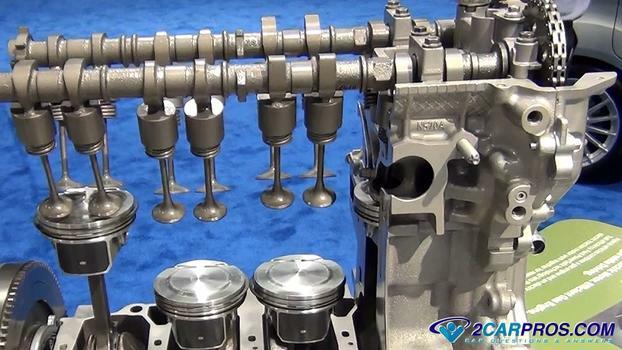 An overhead camshaft set up has the ability to offer two camshafts (DOHC) which is able to accompany twice as many valves for both intake and exhaust. This increases engine top end horse power due to the increased air flow. The camshaft turns at a rate of 1 to 2, in other words the crankshaft of the engine turns twice for every one turn of the camshaft. The camshaft is connected to the crankshaft by a timing chain or timing belt. A camshaft can be designed in such a way that will affect the engine performance characteristics and emission outputs. The distance the valve opens downward in the cylinder head is called lift while the amount of time the valve is open is called duration. Because the combustion process is not perfect the opening of the exhaust valve and intake valve will intersect slightly. While one is closing the other is opening which is called valve overlap. Performance camshafts have increased valve lift, duration and overlap causing the exhaust gases mix with the intake charge of the cylinder which is why engine that have these camshafts have a rough idle. Below is a video of a signal overhead camshaft configuration in action. The image below shows an overhead cam set up with the cylinder head and block cutaway with the lifters directly over the valve spring and four valves per cylinder, two intake and two exhaust. On four valve set ups the valves are slightly smaller in size but will allow more air flow than one larger valve. Here is a end view of a camshaft lifter and rocker for a typical overhead camshaft set up. As the camshaft rotates the lobe which protrudes from the centerline forces the cam follower downward which in turn opens the valve. The rocker is equipped with a needle bearing roller to reduce friction and help the engine's performance. 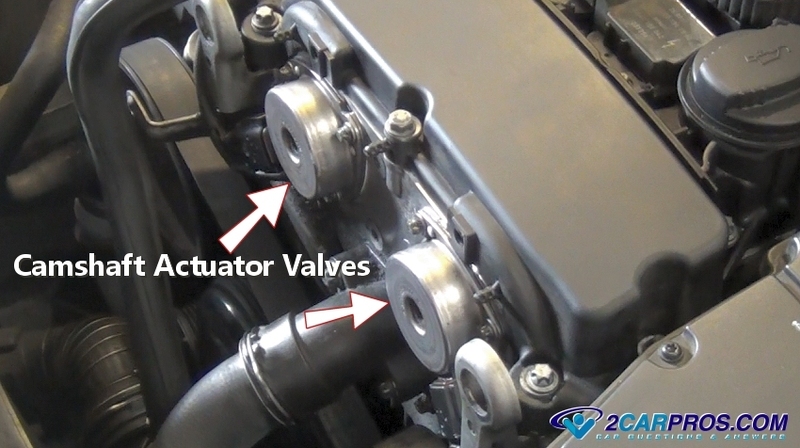 The follower or rocker arm then transmits the force to the valve stem which opens the exhaust or intake valve. This style of rocker arm is also known as a cam follower. On overhead camshaft designs a lifter is located in the cylinder head and is used to automatically adjust the valve lash (clearance). The lifter provides the adjustment between the camshaft and valve which allows the valve to fully close without excess clearance. Engine oil pressure is used to pressurize the lifter plunger to remove this clearance. 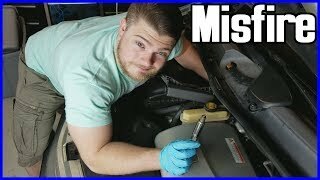 This is why when an engine is low on oil the valve train gets noisy while making a clicking or clattering sound due to the lack of oil pressure. As the rocker arm is forced away from the camshaft the oil valve inside the lifter closes which traps the oil inside the lifter making it solid while opening the valve. 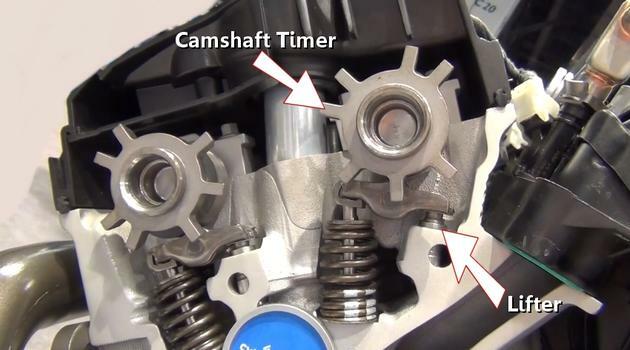 The camshaft also features a timer that is used with the camshaft angle sensor which feeds back information to the car's computer to process and make adjustment in the engine's operating program. There is one lifter for each valve of the engine, (two or four per cylinder). The picture below shows the roller which is situated in the middle of the rocker arm and provides a more efficient way if transferring the camshaft's lift to the rocker with little friction. It also allows a more aggressive camshaft lobe profile which helps engine performance. The lifter galley oil passage is designed into the cylinder head to supply oil pressure provided by the engine's oil pump via the block's internal oil galleys. As in all lifter configurations engine oil is used to lubricate the lifter as well as help it control valve lash (clearance). The camshaft actuator or phaser as it is sometimes called is responsible for the position angle of the camshaft in the relationship to the crankshaft. Before camshaft actuators were used the camshaft sat in a fixed position or "straight up" with the intake and exhaust lobes perfectly split in their duration when the piston was on top dead center (fully up in the cylinder bore). But, when the engine is running and at a lower RPM range it has more power if the camshaft is advanced a few degrees in relationship to the crankshaft. With the same token, the engine has more power at higher RPM if the camshaft is retarded a few degrees in relationship to the crankshaft. This is how the cam actuator was born by giving the camshaft the ability to be both advanced and then retarded giving the engine more power throughout its complete RPM range. An electronically controlled camshaft actuator valve is positioned at the front or rear of the camshaft or in the engine block to divert pressurized oil to one side of the actuator or the other. The actuator control valve receives signals from the computer to move the cam one way or the other. This pressurized oil is what moves the camshaft forward or backwards in relationship to the crankshaft via the actuator which is supplied by the engine oil pump. Through internal passages oil is diverted to one side or the other inside the actuator. In some engine designs the camshaft is located inside the engine block. Because the camshaft is further away from the intake and exhaust valves a different configuration of the rocker arm and lifter is used. The lifter now rides along the camshaft with the camshaft lobe cut at a slight angle at the top of the lobe which spins the lifter slightly to help cut down on wear. Then a long steel pushrod is used between the lifter and rocker arm to work the valve. This design is traditionally less efficient than its overhead counterpart due to the added weight of the additional component which requires a valve spring with more tension to close the valve. In this style of camshaft set up several different lifters are used, the traditional hydraulic, roller, mushroom and solid which must be manually adjusted. Solid lifters are used mostly in racing applications where higher engine rpm for long periods of time can damage normal hydraulic lifters. 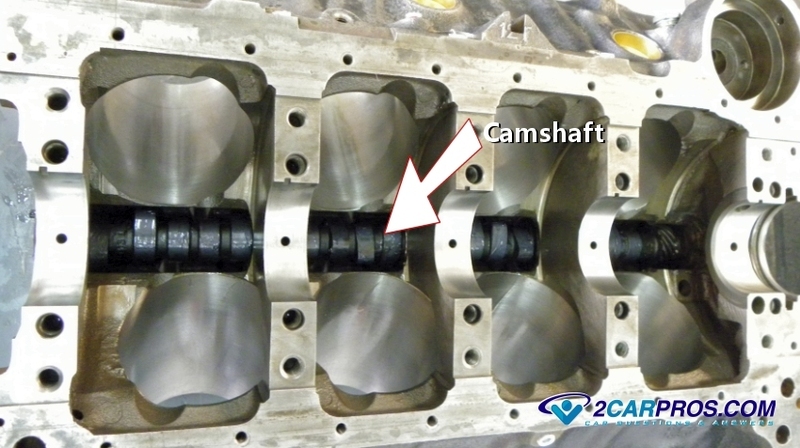 The picture below shows the camshaft inside the block (bottom). In this configuration the lifter rides inside a lifter bore which is located in the engine block itself. 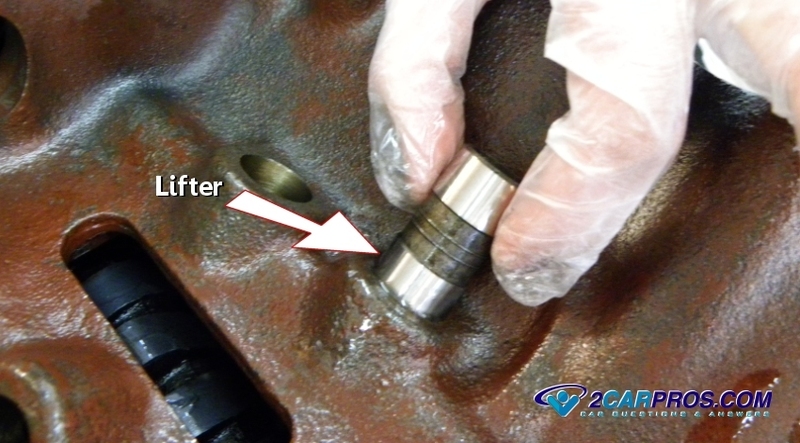 From the lifter a push rod is used to actuate the rocker arm which activates the valve that is located in the cylinder head. Roller lifters are exactly as the name implies. They are designed with a roller wheel and needle bearings that ride along the camshaft which reduces drag. A lifter can also be called a tappet and is positioned in a lifter oil galley much like the OHC model. The picture below shows the lifter being removed from the top side of the engine block. 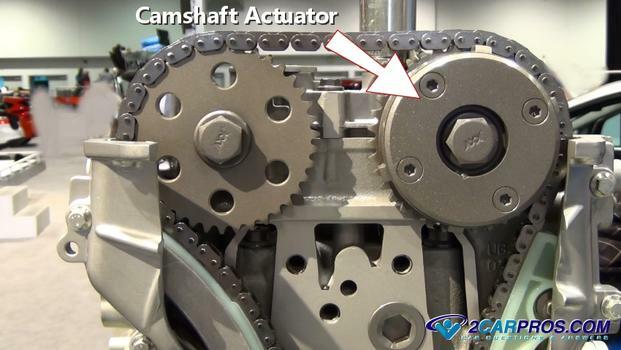 If you have any questions about camshafts or the camshaft actuator, please visit our forum. If you need car repair advice, please ask our community of mechanics who are happy to help. Our service is always 100% free.